This takes the recycling idea to a whole new level. They made a boat, a 60-ft catamaran out of recycled materials, most notably 12,500 2-liter plastic bottles to provide flotation. The mast was at first an irrigation pipe, and so on. Of course, the Plastiki uses green energy, for propulsion but also for electricity. Solar panels, small wind turbines, and even bike turning, to convert human power into electricity. This will also give the crew some exercise during long trips. 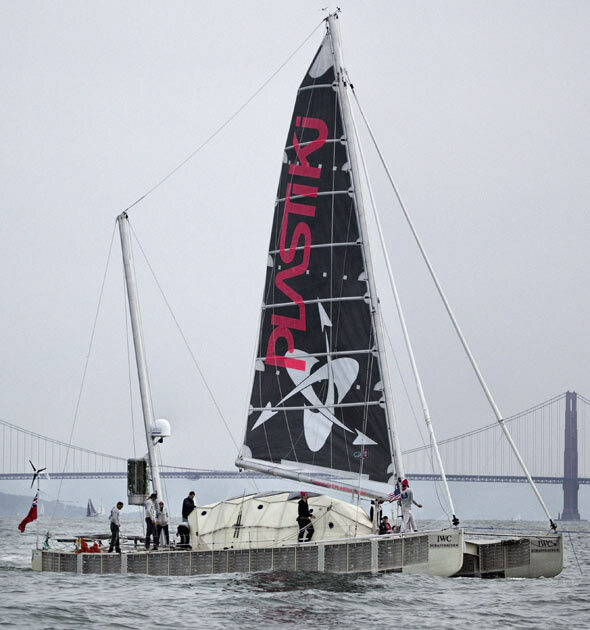 The Plastiki is being sailed by banking heir David De Rothschild and his crew. They left San Francisco last saturday, with the plan to go all the way down to Australia. Which may take 3 months. Or more… Their idea is to highlight the growing plastic pollution that spreads all the seas and oceans of the world. More than 90% of plastics are not recycled. When it comes to sea pollution, it is estimated that plastics makes between 60% and 80% of total marine pollution. The results are that at least 1 million seabirds and 100,000 marine mammals and sea turtles die when they entangle themselves in plastic pollution or ingest it. You can find more about it, and on the boat, on the team’s website. Pictures: courtsey of Luca Babini, from The Plastiki website.